This peasant woman is modelled in silver, in the round. She trudges to market with a pannier on her back, and a bucket and staff. Her head can be removed so that her hollow body can be used as a cup. This figure is a rare survival of small sculpture in silver. 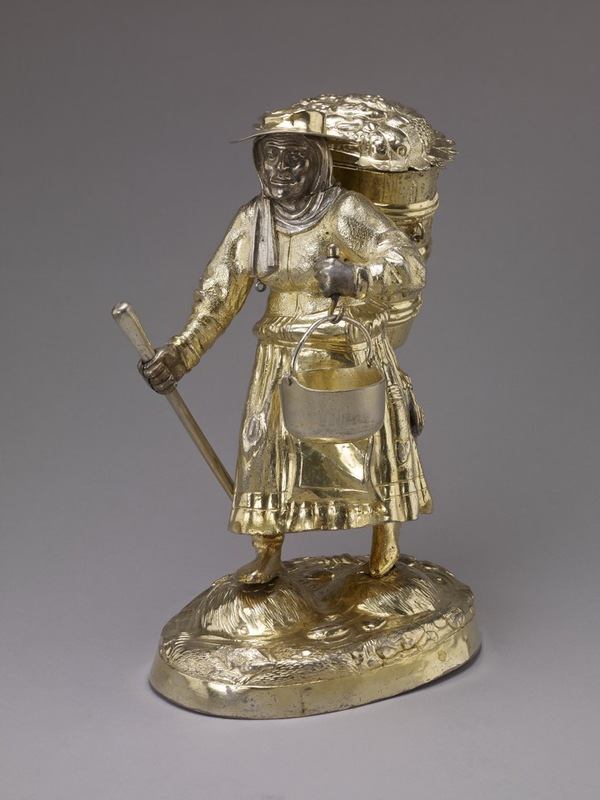 Standing cup; silver parcel-gilt; form of peasant woman walking with covered pannier on back; kettle in left hand, staff in right; case of knives and bag hang from girdle; removable head; cover of pannier embossed to represent fruit; irregular stand with shells in relief; inscribed. This object was collected by Anselm von Rothschild and bequeathed to the British Museum by Ferdinand Anselm Rothschild. Origin: Augsburg; late 16th/ early 17th century; mark of Elias Zorer (master c. 1586, died 1625). Marks: Both marks have been struck close together on the flange of the neck and are normally hidden by the head; also on the side of the base. (i) Assay mark for Augsburg (R3 138(?)) or, perhaps, Seling 36(1613-15). (ii) The conjoined initials EZ with a shield: the punch-mark of Elias Zorer (R3 420). Provenance: Baron Anselm von Rothschild, Vienna, before 1866. Commentary: Elias Zorer was born in Augsburg where he married in 1586, by which time he had become a master goldsmith. He died almost forty years later in Augsburg in 1625, but only a very small part of his oeuvre has been identified. One of his most relevant documented works is the standing cup in the form of a stag tripping, which is preserved in the Schatzkammer of the Residenz in Munich, having been transferred in 1924 from the Silberkammer des Münchener Residenz (H. Brunner, ‘Schatzkammer der Residenz München’, 3rd edn of the Catalogue, Munich, 1970, no. 584; illus. in Seling 1980, p. 249, fig. 149). It is particularly interesting to note that Elias Zorer has again provided a marshy ground with little mounds of tough grass on which the stag's hooves can rest; behind and to the left of the mound at the front is a similar snake and a mixture of stones and plants. The stag appears to be standing in a most convincing and integrated way on this soft ground and, indeed, one of his hind legs seems to be sinking a little into the soggy earth. Zorer appears to have striven for realism in all these details - a skill that is especially important when creating a small genre sculpture, such as the peasant woman trudging to market with her pannier full of produce for sale. For a detailed discussion of the work of the slightly earlier Nuremberg goldsmith Elias Lencker, and the background to his successful attempt to create a small-scale silver sculpture of this kind, see WB.133. Reference was made there to the near-contemporary ivory carvings of craftsmen and peasants by Christoph Angermair between 1611 and 1615 for various prominent German princely patrons, as well as to several documented small-scale wood and bronze sculptures of a similar character. This peasant woman by Elias Zorer is part of that tradition and should be compared not only with the goose-man model in wood (in the Germanisches Nationalmuseum, Nuremberg, illustrated in H. Weihrauch, ‘Europäische Bronzestatuetten’, Brunswick, 1967, pp. 319-20, fig. 390) but also to the painted wooden figure of a peasant woman carrying a goose and a small basket which is preserved in the same museum (H. 36.3 cm - illustrated and described in ‘Dürers Verwandlung in der skulptur zwischen Renaissance und Barock’ Liebieghaus, Museum alter Plastik, Frankfurt, 1981, p. 177, no. 109; also S. Meller, ‘Die Deutschen Bronzestatuetten der Renaissance’, Munich, 1926, pls 45 and 48; exhibition catalogue, Peter Flötner und die Renaissance in Deutschland’, Nuremberg, 1946, no. 71). The painted figure wears a hat over her ‘headscarf’ drapery in the same way, and both the apron and skirt with the slightly bulging dress above are remarkably similar. However, this painted figure (and the companion male figure) are shown standing motionless. When published in the Frankfurt 1981 exhibition catalogue ‘Dürers Verwandlung’ they were attributed to “Süddeutschland, 1587”, though it is evident that the carved square bases are later. The face of the painted female figure holding the goose has none of the vigorous characterisation of Elias Zorer's silver figure, but as the painted face may have been restored at a later date no reliance can be placed on its present appearance. More reliable is the evidence of a bronze standing figure of a peasant woman carrying a large, two-handled, covered cooking pot on her head (formerly in the collection of Dr A. v. Frey of Paris - illustrated and discussed in Weihrauch 1967, p. 342, fig. 416, where it is attributed to a Flemish workshop “um 1560/70”). The face of the woman is more full of character and closer to Elias Zorer's portrayal. The movements of the figure are expressive of the weight of the burden she carries on her head and of the concentration and doggedness required - not unlike Elias Zorer's sturdy peasant woman. Both have an ungainly, heavy quality, but both appear to be well co-ordinated in a slow, rhythmic fashion. The bronze figure has equally meticulously observed details, such as the rosary hanging from the belt, the large, plain belt buckle and the simple, almost clumsy, footwear that is revealed by the calf-length skirt. Among the few related silver sculptures from the Augsburg workshops of Elias Zorer's contemporaries are the pair of standing-cups in the form of figures dressed as pilgrims to the shrine of St James of Compostela. The female figure has a strikingly modelled face, framed by the ‘headscarf’ drapery under a broad-rimmed hat; the head can be detached in exactly the same way as the head of the Elias Zorer peasant woman. The examples in the Kunsthistorisches Museum, Vienna, are from the Schloss Ambras collection and therefore have an unbroken history in the Hapsburg collections (see E. Kris, ‘Golschmeidearbeiten des Mittelalters, der Renaissance und des Barock. I Teil: Arbeiten in Gold und Silber’, Publikationen aus den Kunsthistorischen Summlungen in Wien, Band 5, Vienna, 1932, p. 46, nos 73-4, pl. 48). A second pair marked by Leonhard Umbach are in the Iparmüvészeti Museum, Budapest (see ‘Welt im Umbruch: Augsburg zwischen Renaissance und Barock’ II Rathaus, Augsburg, 1980, pp. 380-1, nos 757-8, with illus. and a brief discussion by Hannelore Müller). Although the two pairs of pilgrim figures are more elaborately clothed and have cold enamel decoration (especially on the faces, ‘headscarf’ drapery and hands), the general overall effect is similar to the Elias Zorer peasant woman; indeed, the gently domed oval bases of the pilgrim figures are naturalistically embossed in a similar fashion. It is the difference in style and quality between the embossed and chased decoration on the naturalistic base of Zorer's peasant woman and on the cover of her pannier that gives rise to serious doubts about the origin of the cover. The repetition of the stiff, four-petalled flowers and the crude engraving of the projecting flange are unexpected. The evidence is inconclusive, but the figure seems better designed and more balanced when the cover is removed. Nevertheless, the figure is of exceptional quality, being a rare survival from a class of genre sculpture patronised at the German courts around 1600. Hugh Tait, 'Catalogue of the Waddesdon Bequest in the British Museum, II : The Silver Plate', British Museum, London, 1988, no. 48, figs. 264-268.